This group of barrows is about a mile to the west of Stonehenge. A Neolithic long barrow is at the top/left (actually, south-west) of the group in the photo (adjacent to the traffic roundabout). The rest are Bronze Age round barrows of various type. A ‘saucer barrow’ has a relatively low mound (like an upturned saucer), no berm, a ditch, and can have an outer bank. In the ‘bell barrow’, the mound is separated from a ditch by a berm. There may also be an outer bank. The mound of a ‘disc barrow’ is relatively small, separated from a ditch by a wide berm. Once again, there may be an outer bank. The ‘pond barrow’ (to be pedantic, it isn't really a barrow, since it doesn’t have a mound) is a circular depression surrounded by a banked rim. Though burials are found in them, it is thought that this was not the prime function of pond barrows – they may have had a ritual purpose. The work now offered to the public will be found to contain a record of the examination of above two hundred and thirty sepulchral mounds, belonging to a period before the occupation of Britain by the Romans. A considerable part of many years has been devoted to this examination; and, I trust I may say with confidence, the facts collected during this process have been carefully and minutely observed and accurately recorded. This barrow produced a large number of burials, all of them, with one exception, appearing to be secondary, and many of them mere insertions. They were all placed at a very slight depth beneath the present surface of the mound. At a distance of 14ft south-west of the centre was the body of a man, placed 6ft above the natural surface, and laid on his right side, with head to W.N.W., and the hands up to the face. At the crown of the head was a ‘food vessel’, and behind the head a long flint scraper [there follows a description of the food vessel and scraper] … The body had been inserted in the barrow, which, as has already been observed, was made of chalk, and the hollow in which it was placed had been filled in with earth, but along the back of the body some large flat pieces of chalk were set on edge. Twenty-seven feet west-by-south of the centre, and 4½ft above the surface, was the body of another man, laid on the left side, with the head to N.N.W., the right hand being up to the face and the left on the right arm. [There follows a description of a flint knife placed at the feet] … Twenty-one feet west-south-west from the centre, and 6ft above the ground-level, was the body of a woman, laid on the right side, with the head to N.W. by N.; the right arm was extended and the hand placed under the knees, the left hand being up to the face. Between the head and knees was a ‘food vessel’. This body was evidently an insertion, and was deposited in a hollow filled in with earth, having a thin chalk flag laid over the knees and the vessel. [There follows a description of the vessel] … Close to the last body were the remains of a disturbed one, with many pieces of a ‘drinking cup’ [i.e. Beaker], which had probably been associated with it … Twenty-one feet west-by-south from the centre, and 6ft above the natural surface, was the body of a second woman, laid on the right side, with the head to N. by W.; the hands were crossed in front of where the hips had been, but these, together with the bones of the legs, had been cut away by the introduction of the interment last mentioned. Behind the head was a ‘drinking cup’, 4¼in high, 4in wide at the mouth, and 2½in at the bottom. 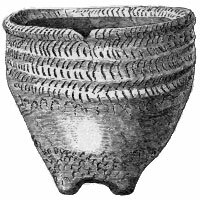 It is … ornamented over the whole surface by encircling lines of twisted-thong impressions [this Beaker’s description matches the early, ‘all-over-cord’, one pictured on the Beakers and Bronze page]. Twelve feet south-south-east from the centre, and 6¼ft above the natural surface, was the body of a child, about 3 years old, laid on its right side, with the head to S.S.W. Seven feet and a-half south-south-east from the centre, and 7ft above the surface, was the body of another child, rather younger than the last, also laid on its right side, with the head to N. by E. On the same level, 6ft south-east-by-south of the centre, and apparently in the undisturbed chalk of the mound, was still another child, about a year old. Just west of this, but about a foot higher, was part of the skull of another child of about the same age; whilst 4ft east-south-east of the centre, and nearly at the same height as the two children’s bodies just named, were two other children, laid close together, the elder in front of the younger, both on their left sides, and with their heads to N.E. by E., and the hands of both up to their respective faces. Between the face of one and the back of the head of the other were two flint chippings. These bodies also were placed apparently in the undisturbed chalk of the mound. Six feet east of the centre, and at the same level with the last-named children, was yet another child; while 3ft west of it were several disturbed bones of another child. Seven feet and a-half north-north-east from the centre, and at the same distance above the ground-level, was the body of a young woman, the epiphyses of the thigh bones not being united; she was laid on the right side, with the head to S.W. by S., the right hand being under the corresponding thigh, and the left on the chest. Between the face and the knees was a ‘food vessel’. [There follows a description of the food vessel] … Seven feet north-north-east of the present centre, but no doubt coincident with the original one, and clearly the primary interment, was the body of a child, scarcely a year old, on its left side, with the head to N. by E. It was placed on the natural surface in a slight hollow, with a direction of west-north-west by east-south-east, 5ft long and 3ft wide, and lined with wood, which towards the east end was charred. Close to the child, also towards the east end of the hollow, were some of the bones of, apparently, a young woman, placed certainly with some regard to their proper order, but by no means presenting such an appearance as would imply that when the interment took place there had been an entire body. The head was on its left side, but there was no lower jaw with it; the other bones were in such a position as to show that it had been intended to lay the body on the right side, but there was no left femur, no vertebræ, and none of the bones of the arms, except the left humerus. The bones still remaining were in such a sound condition as to render it impossible to suppose that those which were wanting had perished by decay, so that there can be no room for doubt that when the child was buried certain parts of the skeleton of another body had been placed in association with it, the bones probably of one removed from some other place of deposit, and possibly those of the mother. It has already been mentioned that there was a deposit of dark fatty earth upon the level of the ground, extending throughout the whole barrow, and increasing in depth up to the centre, where it attained a thickness of 2½ft. This deposit was full of burnt earth and charcoal in every part; but there was more evidence of burning in that part which immediately overlaid the natural surface. There were also in it a very large number of animal bones, as well as sherds of pottery, principally of plain dark-coloured ware, flint implements, and chippings of the same material. Amongst the implements must be numbered 79 saws; 17 scrapers; 3 leaf-shaped arrow-points; 2 pointed tools (probably for boring); several flint articles of uncertain purpose; a hammer-stone; and a piece of a greenstone axe. Many of the saws are very delicately serrated, some along both edges, and showing by the glaze upon the edge that they had been in use. The number of saws was very surprising, and far exceeded the aggregate of those obtained from all the barrows I have opened; and it is by no means easy to give any reasonable explanation of the phenomenon. Late in the 3rd millennium BC, a round barrow was raised over a Beaker grave at Hemp Knoll in the chalk downland of southern England, three miles south-west of Avebury in Wiltshire. The burial rite, as revealed by excavation in 1965, illustrates well this complex process of the transformation of the dead person into a new state. The first act of the rite was to dig a large, deep burial chamber using antler picks. Next, a wickerwork coffin was placed at the centre of the grave, which contained a skeleton placed in a crouched position on his left side. The body was of a 6ft male, aged between 35 and 45. We know very little about the organic objects placed with the deceased because they did not survive in the chalkland soils. However, by analogy with burials elsewhere, the body was probably clothed and/or wrapped in a shroud. It may have also been bound with twine soon after death into the crouched position revealed by the skeleton. Associated with the body was an archer’s wristguard made of greenstone. Although it was worn on the left forearm, it had been broken before burial. A bone object – a toggle or belt ring – was recovered beneath the dead man’s right thigh. This was also broken and the severed edge had been subsequently decorated. It may have been sewn onto the clothing or shroud so that its broken decorated edge was on display. It is possible that the coffin was opened in the grave to allow a highly decorated Beaker to be placed at the foot of the skeleton. This would have allowed mourners to view the corpse for a time in its final resting place. In addition to the coffin, part of a timber planked structure was identified in one corner of the grave. By analogy with other Beaker graves, it may suggest that a timber mortuary ‘house’ enclosed the coffin. This structure may have allowed the coffin to be viewed or accessed for a period before the grave was finally backfilled and the barrow raised. Sometime later, further deposits were included as the grave was being filled in. A roe deer antler – perhaps used in the grave digging – was discarded on one side of the burial. On the other, the four feet and skull of an ox were added when the grave was half-filled with chalk blocks. As with so many Beaker burial sites of this date, the mound was not raised to commemorate a single grave. Before the mound was built, a second grave of a young child was dug next to the coffined male. A small ditched barrow was then thrown up and at least one further burial – the cremated remains of an individual placed within a food vessel – was inserted into the central burial area. Looking at the full grave-plan, it would be easy to imagine that the corpse was ‘on display’ within its large grave for mourners to see. However, the relationships between structures, objects and the body – so apparent during archaeological excavation – may not have been so clear to the mourners themselves. Much was carefully controlled, and hidden from view. Management and control of the corpse had started right at the beginning of the funerary sequence, when it was probably washed, clothed, bound into a crouched posture and then perhaps wrapped in a shroud of animal skins and placed in a coffin. Binding and wrapping seems to symbolise containment; or controlling the power of the dead. It certainly signifies a change in the dead person’s state, away from the individual ‘personality’ known in life to a new status of ‘ancestor’. It was 54ft in diameter, 4ft high, though a good deal ploughed down, and made of earth, with an admixture of some chalk.… Fifteen feet south of the centre, and about 1ft above the natural surface, was a body, probably that of a man about 20 to 25 years of age, lying on the right side, with the head to W., the left hand crossed over and clasping the right, and both up to the face. Above the knees was a very peculiar vase which must be classed amongst the ‘food vessels’. It has four feet set upon a round bottom … Amongst the material of the mound were many flint chippings; five round scrapers, and one oval, left-handed one; a most symmetrically-formed and beautifully flaked willow-leaf-shaped arrow-point of flint … the half of a spindle-whorl, of baked clay … some charcoal, several fragments of pottery, and many broken bones belonging to four oxen and three goats or sheep, all of them adults. It was 44ft in diameter, 5ft high, and was formed of earth and clay with a few stones intermingled. Three feet east-south-east of the centre, and having its mouth placed but 1ft below the surface of the barrow, was a cinerary urn standing upright. It was filled to the top with a deposit of the burnt bones of a person of full age but of small size. The urn [on the left] is 12in high, 9in wide at the mouth, and 4in at the bottom … At the centre of the mound and just beneath its surface were a few stones placed together for the protection of a second cinerary urn, whose top was met with 2ft below them. The urn [on the right], which stood upright, was carefully packed round with clay and charcoal in large pieces. It was deposited about 1ft above the natural surface, the intervening space having been filled in with well-worked clay. The bones which it contained, those of a young person of average size, were so completely burnt that they occupied a space of only a few inches at the bottom of the urn, which is however no less than 16in high, 12½in wide at the mouth, 16in at the bottom of the overhanging rim, and 4½in at the bottom.… Amongst the material of the barrow were found scattered here and there numerous chippings of flint, a round flint scraper, and various sherds of pottery. The grape cup (diameter approx. 85mm) from the Golden Barrow. On the northern banks of the river Wily is a barrow, which from the nature and richness of its contents we have denominated the GOLDEN BARROW. It was opened for the first time in the year 1803. At the depth of two feet we found a little pile of burned human bones placed in a shallow bason-like cist, and at the distance of one foot from the bones was a considerable quantity of ashes intermixed with small fragments of burned bones. About two feet from the pile of bones, the following articles were discovered. 1. 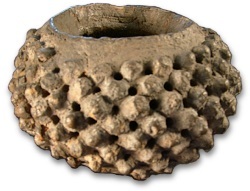 Thirteen gold beads made in the form of a drum, having two ends to screw off, and perforated in two places on the sides for the purpose of stringing. 2. A thin plate of the same metal, six inches in length, and nearly three in width, richly wrought, and perforated at the four corners. 3. Another ornament in form of a cone, decorated with circles and zigzags, and fitted closely to a piece of dark wood, like ebony, on which the marks of the pattern still appear impressed; the bottom part of this article is also perforated. The above are all of pure but thin gold, neatly worked, and highly burnished. The large flat plate must have been, like the cone, strengthened by a strip of wood behind; and the whole, by their several perforations, are strongly marked as forming the decorative accoutrements of some distinguished British chieftain. Besides the above, were two small articles in gold, resembling little boxes, about an inch in diameter, with a top, in the form of a cone, to take off. I cannot conjecture to what purpose these were appropriated, as they bear no sign of perforation.… Besides the above precious articles of gold, we discovered some large plates of amber … and above a thousand beads of the same substance, and of different sizes; also a curious little cup, studded over with projecting knobs [known as a ‘grape cup’] … Such was the result of our researches in the year 1803; but not being completely satisfied, and still thinking that the primary interment had escaped our vigilance, I was anxious that a further trial should be made, which took place in July, 1807, and was attended with success; for, on the same level, and within a few inches of the very spot where the golden trinkets and the amber beads had been found, we discovered two cups, the one placed within the other. The largest of these was covered with a profusion of zigzag ornaments, but on taking out, was unfortunately broken to pieces; the smaller one [a miniature Collared Urn], containing about a pint, is quite plain, and in good preservation. [A small bronze dagger and a bronze awl were also found] … Still pursuing our excavations to the floor of the barrow, we there found an oblong cist, about eighteen inches deep, which contained a simple interment of burned bones, unaccompanied with either arms or trinkets. 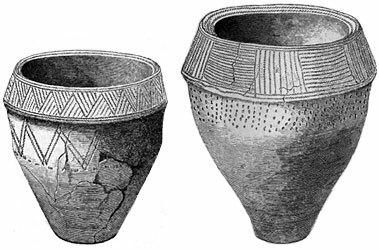 This was certainly the primary funereal deposit; but, however rich in materials, or elegant in form, the articles found nearer the surface of the barrow may be deemed, their high antiquity cannot be disputed; for although the grape cup exceeds in beauty and novelty of design any we have as yet discovered, the other two cups of unbaked clay, and rude workmanship, bespeak the uncivilized æra to which the construction of this sepulchral mound may be justly attributed. There is no longer any visible trace of the Golden Barrow. 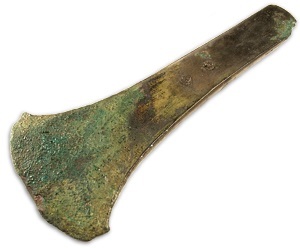 Bronze flanged axe-head (159mm x 67mm), with cloth imprint visible on the blade, from Bush Barrow. A large (today, 40-odd metres in diameter and over 3 metres high), un-ditched, bowl barrow, in the Normanton Down group of barrows, about half a mile to the south of Stonehenge. 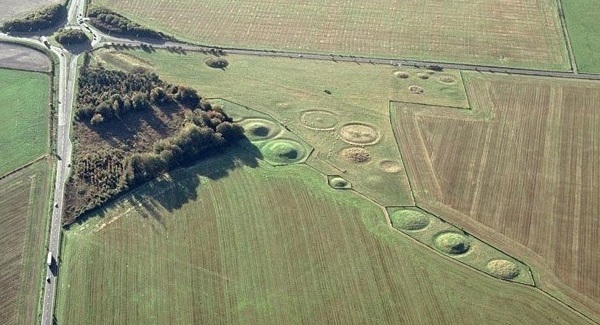 Bush Barrow (also known as Wilsford G5) was excavated in 1808 by William Cunnington and Sir Richard Colt Hoare. Beneath the mound was the skeleton of a man, described as “stout and tall”, laying, “from south to north”, on the original ground surface. He was accompanied by two bronze daggers (one of which disintegrated when disturbed), a copper dagger (the wooden handle of which had been inlaid with tiny gold pins*) that probably came from Brittany, possibly another bronze dagger (near the man’s head were found fragments of bronze and wood and bronze rivets), a bronze axe-head (its corrosion bears an imprint of cloth, in which it was, presumably, wrapped), a decorative stone mace-head (there are carved bone bands, which probably adorned the mace’s shaft), and three items of gold-sheet: a small diamond-shaped ‘lozenge’ (possibly another item of decoration from the mace’s shaft), a large (18cm x 15cm) ‘lozenge’ (it had been placed on the man’s chest and had had a wooden backing – its purpose is not clear), and a belt-hook (over 7cm square, it too had had a wooden backing). Finds from both the Golden Barrow and Bush Barrow can be seen at the Wiltshire Museum, Devizes. I must add in conclusion, that I regret to say, that the Corselet suffered considerable mutilation. Mr Langford, upon its discovery, having no idea of its value, threw it into a hedge, and told the workmen to bring it with them when they returned home to dinner. In the mean time several persons broke small pieces off it, and after I saw it, one piece of gold, apparently a shoulder strap, which was entire (or piece passing over the shoulder from the front to the back of the arm) was taken away; two small pieces, of what I believe to have been (from its similarity to what I had seen) the other shoulder strap, with several small pieces of copper upon which the gold was fixed, are still in Mr Langford’s possession; several rings and breast pins have been made out of the pieces carried away. Canon Greenwell … a clergyman whose methods have led archaeologists to wish that he had used his knees more often in prayer and less frequently in excavation. Rev. Clough wrote this letter to John Gage, Director of the Society of Antiquaries of London. Gage quotes it in a letter that he wrote to Sir Henry Ellis, Secretary of the Society and Principal Librarian of the British Museum, which was published in Archaeologia Vol. 26 (1836): ‘A Letter from JOHN GAGE, Esq. F.R.S., Director, to Sir HENRY ELLIS, K.H., F.R.S., Secretary, accompanying a Gold British Corselet exhibited to the Society, and since purchased by the Trustees of the British Museum’. T.G.E. Powell ‘The Gold Ornament from Mold, Flintshire, North Wales’, Proceedings of the Prehistoric Society Vol. 19 (1953).